Henry George, American economist and social philosopher (b. Philadelphia 1839, d. New York 1897). Principal works: The Science of Political Economy, Progress & Poverty, Protection or Free Trade, The Condition of Labor, A Perplexed Philosopher, Social Problems. 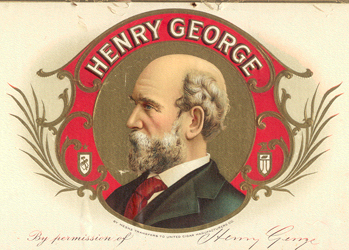 Henry George is a product of America. His contribution to modern economic thought grew out of the experience of America–its freedom of opportunity, its incentives for invention and production, its march of material progress. In the frontier West — in San Francisco — where Henry George rose as a young man from typesetter to editor and publisher, he saw the workings of economic forces in the raw. And he studied them. He made America his economics laboratory in which he formulated a philosophy of freedom indigenous to America and an answer to the collectivist theories of old world. The cultural heritage of Henry George is broad. He drew upon the experience of every race and every civilization to discover and test the law of human progress–association in freedom–the final object of his inquiry. Witnessing the growth of modern industrial civilization, Henry George was profoundly disturbed by the trends toward centralized control, Gargantuan taxation, disregard for the rights of person and property, which he saw setting in, and which, carried far enough, he believed, must bring progress to a halt. Challenged by the economic and social problems of modern times, he sought answers in the study of the classical economists — Adam Smith, John Stuart Mill, David Ricardo — against the background of his observation of the expanding American economy. He found answers in measures of greater freedom rather than less. He identified freedom of opportunity as the natural remedy for current problems. Several full-length biographies exist, including one by Henry George, Jr. And Ed Dodson of the Philadelphia Henry George School has put together a fine slide show about Henry George. "Share nature, charge for damage, don't steal wages."